Members of the Mekane Hiwot Abune Gebre Menfes Kidus and St. Arsema Ethiopian Orthodox Church celebrate Meskel, the finding of the true cross of the Crucifixion. This was the first time a Meskel celebration has been held in Hampton Roads. (News24) - Ethiopian Prime Minister Abiy Ahmed has overseen the reunification of two feuding wings of one of the world's oldest Christian churches, his top aide said on Friday. The Ethiopian Orthodox Tewahedo Church split in 1991 over the naming of a new patriarch after the Ethiopian People's Revolutionary Democratic Front (EPRDF) removed the Derg military junta from power. See here for more on that. Dissidents founded a breakaway church based in the United States under the exiled former patriarch, after leading church officials claimed that ousting him violated rules that say the role is held for life. Talks between the two synods have been going on for years. Abiy, a reformist new premier, is credited with speeding up the peace process, which culminated on Thursday in his maiden visit to the United States. Abiy oversaw a reunification ceremony in Washington, attended by priests in flowing black and red robes, state media reported. "After significant mediation efforts, PM Abiy witnessed in DC the reunification of the 2 Synods of the #Ethiopian Orthodox Church. The 2 Synods are reunited into one Holy Synod after 27 years," his chief of staff Fitsum Arega wrote on Twitter. Further details of the reunification and how it would work in practice were not immediately available. 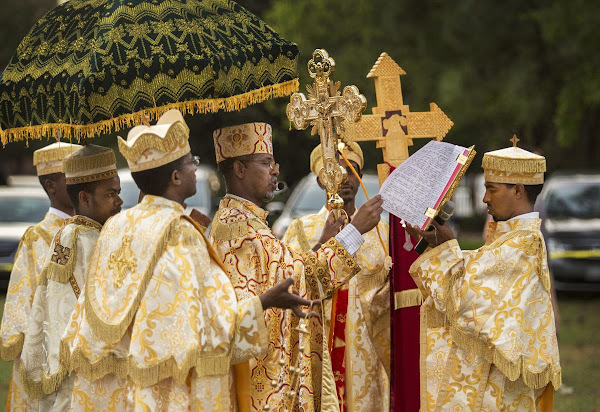 Tracing its roots back to the fourth century, the Orthodox church is Ethiopia's largest, gathering 38 million people, according to the World Council of Churches. The country is also home to a Muslim minority and a growing protestant population that includes the prime minister. "Prime Minister Dr Abiy Ahmed said it is impossible to think of Ethiopia without taking note of the Ethiopian Orthodox Tewahedo Church, which he said, is both great and sacred," the state-affiliated Fana Broadcasting Corporate said. "While noting that the reconciliation event marks a historic jump, the Prime Minister emphasised that this has been something overdue," the broadcaster said. It added: "The unification and reconciliation committee extended its deepest gratitude to Prime Minister Dr Abiy Ahmed for his significant efforts during the reconciliation process." Since taking office in April, Prime Minister Abiy Ahmed has prioritised reconciliation between dissidents and the EPRDF, which has held power unopposed for 27 years. He has released numerous jailed dissidents from Ethiopian jails, and sometimes met them personally upon their release. Earlier this week, he called for "multi-party democracy," a stunning shift for the EPRDF which has been in power continuously since 1991 and holds every seat in parliament together with its allies. The visit to the US is set to be something of a charm offensive for Abiy. After his arrival in Washington, Reuben E Brigety II, a former American ambassador to the African Union headquarters in Ethiopia, tweeted a photo showing the prime minister smiling and holding hands with a lone protester who greeted him outside the Ethiopian embassy. He is also visiting diaspora communities in Los Angeles and the state of Minnesota in a visit the Ethiopian government has titled "Tear down barriers, and build bridges!" Hundreds of thousands of Ethiopians live in the US, among them numerous journalists and politicians who have fallen out with the EPRDF. The Ethiopian Patriarchate (EP) and the Ethiopian Orthodox Church Outside Ethiopia (EOCOE) has reunited. This is similar to the 2007 MP/ROCOR reunification overseen by Putin.